Ten Questions For A Critic: The State Of Classical Music : Monitor Mix Anne Midgette, classical music critic from the Washington Post, and NPR's Tom Huizenga look back over a decade of changes in the world of classical music. Let's face it, the world of classical music is fairly far off the radar screen for most people in this country. Still, there are huge numbers of passionate classical fans, posting on dozens and dozens of classical blogs and chat rooms, downloading everything from Beethoven to Bang on a Can, and attending operas, symphonies and chamber music concerts. 1.) Tom Huizenga: Let's start with the classical recording industry. What happened? Anne Midgette: Well, the recording industry has suffered from a blockbuster mentality that doesn't work very well in the internet age of the so-called "long tail" theory. That is, the internet is predicated on the idea that you can sell a lot of different kinds of things, but sell slightly less of them. It's a great niche market, and the major classical labels are still looking for those blockbuster sales which are harder and harder to get in any form of media entertainment these days. Pop music, too, is not hitting the same kinds of sales targets it used to hit. Therefore, you see a lot of erosion in the output of major labels, specifically those owned by Universal Records. Where labels like Harmonia Mundi are doing well, issuing very high quality products, but without the same aspirations to sell 100,000 copies of it. TH: Right, because their standard of sales was always lower to begin with. AM: Which is realistic. If you think about the way the classical catalogue works today, you want something you can keep in the catalogue for a very long time and keep selling it. You're not necessarily going to get so many sales right out of the box. And Universal is still investing heavily in the latest beautiful soprano in a glossy package, and I'm not really sure that's what people are looking for today. The audience, I believe, is much more catholic in its taste — with a small "c" — willing to embrace lots of different kinds of things and try different things, but I don't know that a $25 CD of another pretty face is going to appeal that much to an audience that is, by and large, more discriminating. TH: And it seemed like for a while, in the early 2000s, the major labels were casting off A-list artists and all of a sudden, artists who were once on the big labels — EMI or BMG or Sony — had to fend for themselves. AM: Well, that's been in a way productive. What you see is that, even very top level artists are realizing that there's not necessarily an advantage to being with a major label. And people are going out and founding their own labels. People like Gil Shaham, who is one of the leading violinists today and who has his own recording label. The internet and so-called new technology has made this a lot more accessible to people. It's a lot easier to manufacture a CD and find distribution for it. 2) TH: The rise of the internet over the last ten years. We've talked a little bit about how it affected us as music consumers, but what about musicians? AM: I think it's had very beneficial effects in terms of people's openness, entrepreneurial spirit. Entrepreneurship is now something that's taught increasingly in more and more music schools. The idea that as a composer, you write a piece and then you perform it and you record it and you make your CD and you distribute it, there's all kinds of music crossing genres, bringing in new influences. I think this is a big trend right now. And again, it goes back to the 18th century model of the composer-performer. Mozart played his own pieces and he wanted them to be played too. There's a much more hands-on spirit to making music. TH: And some musicians might have a daytime gig in an orchestra but also a weekend gig in some indie band. AM: Absolutely. Or the composer Mason Bates who is a DJ as well as a composer, who wrote a concerto for DJ and orchestra for the San Francisco Symphony. And now he's one of the composers-in-residence coming up at the Chicago Symphony under conductor Riccardo Muti. That's a real illustration of the jack-of-all-trades mentality. Mason also has a flourishing career as a DJ, and the way that the conventional classical music world (the Chicago Symphony and Muti: it doesn't get more blue-chip than that) is now open to that kind of thing which, I think, a couple of years ago would have been more frowned on. 3) TH: As a music journalist, has the internet affected your job as a classical critic? AM: I think the internet has some really positive ramifications for the role of a critic, which is getting a little dusty along the conventional model. A critic has traditionally been someone who makes pronouncements from on high and is passively received and often hated by readers. I'm all for embracing the widely touted internet idea of building communities rather than simply lecturing at people. I'm very much for critics having blogs for example, which you're seeing in more and more. The kind of interaction that makes possible the ability to build a community of people who love music and think about it is a wonderful thing, and not something newspapers have been able to do. And as newspapers seek to redefine their function, this is, I believe, a very important way to make that happen, at least in the arts. 4) TH: Have any of these changes we've been talking about affected the sound of the music? Are composers writing music that actually sounds different? AM: I think the catholicism of taste that I mentioned before is strongly reflected in a lot of contemporary music. A lot of the most exciting or most distinctive contemporary music that's going on right now... the three composers that founded the collaborative group Bang on a Can have moved in this decade from being tenacious mavericks to real elder statesman. David Lang won a Pulitzer Prize. And Steve Reich has won a Pulitzer Prize. This signals a kind of mainstream acknowledgement and acceptance of a kind of music that was for a long time thought of as very marginal and fringy. And most of the groups that people are excited about right now, Alarm Will Sound, eighth blackbird --these chamber groups were all founded in the last 10 years and are much more wide-ranging and pop-influenced in their tastes. You have electric guitars on stage. You have no fear of different instruments. I think that's very much a trend of the last 10 years and I think that's continuing to develop. TH: It might play well in Manhattan, but do these new groups — Bang on a Can and eighth blackbird — how well do they play in Peoria, as they say? AM: I had a lot of people in smaller markets asking me about precisely this kind of thing. One small group in Ohio were trying to change their profile precisely because they were feeling the audience falling off, and they wanted to bring in particularly this kind of group in order to revitalize what they were doing. But I have also heard stories of Bang on a Can going out to a smaller market and people not getting it or understanding what it is. But one thing the internet has certainly done is make the audience a lot more universal. There's not as much of a distinction between music lovers in Roswell, NM where I went to high school and music lovers in New York. 5) TH: What about box office in the last ten years — at the symphony, at the opera? Are there any trends here? AM: Well, I think the symphony certainly has seen a decline in box office. The gradual decline in orchestra audiences has been an overriding topic among symphonies for the last ten years, if not more. I think part of the problem is something you can see, with say the Metropolitan Opera, where Peter Gelb came up with a lot of new ideas and inspired a lot of new energy. But there's still not always the same amount of excitement on stage. I think opera in particular is a genre that is very accessible for new audiences, but you have to do something that is artistic and something more than merely the kind of conventional pageantry where you put on a blonde wig and a soldier's outfit and go through the motions. That kind of thing lulls your established audience into a sense of security but it's never going to win over new audiences. However, if you step up the artistic vision and the artistic energy, there are plenty of audiences that are perhaps more open to it. I know that, for example, a woman I know in her 30s who used to live in San Francisco was talking about how she used to see Michael Tilson Thomas and the San Francisco Symphony, all the time. And then she moved to New York, but she never went to the New York Philharmonic. Because the San Francisco Symphony under Michael Tilson Thomas represents a kind of openness and new energy; they're on TV, there's something interesting happening there. TH: It's almost like a brand. AM: Exactly. But it is a brand that has more appeal to the 30 and 40-something audience than the New York Philharmonic does even now, with their much heralded, new conductor Alan Gilbert, whom I hope opens things up for a new audience in wonderful ways. And this particular woman when she moved to New York started going to the Brooklyn Academy of Music instead, where they do more interesting sort of funky things. 6) 15) TH: Luciano Pavarotti died in 2007. Did that shake the opera world at all? AM: By the time Pavarotti died, he was no longer that active in the opera world. I think that Pavarotti's death might symbolize for some people the idea of an old model of an opera singer — Pavarotti not having been a particularly good actor — the big fat man with the beautiful voice standing there. Pavarotti's actual significance in the opera world was that he was a real pioneer in the way he reached out to audiences. He was seen as shocking for doing things that today singers do as a matter of course. Stadium concerts, TV commercials, appearances in glossy magazines — those are kind of par for the course now. And Pavarotti kind of brought the glamour back into a world had been increasingly elitist. Unfortunately he also helped to found the genre of so called cross-over, which basically means people who aren't quite opera singers, singing operatic-like music in large venues. TH: A kind of a tangential thing with Pavarotti is that since the rise of the Three Tenors in the 80s and 90s, we're always on the lookout for the next big tenor. And I'm wondering what you think of the story of Rolando Villazon, whose career rose high in the past 10 years but made a recent precipitous drop. AM: I think the tragedy of the expectation of the Three Tenors-type success is that you see these hothouse careers where the next big tenor who comes along is madly hyped for a couple of years and can't live up to it whether because he doesn't have the goods or because, as in Villazon's case, he has a wonderful exciting talent but simply sings his voice completely ragged to a point that's led him to surgery and months and months off. And there's always a rumor that he's coming back again. I think the public, through this, has come to get a little less attached to its big stars. One of the things about the Three Tenors phenomenon was that all of those artists had 30 years of solid stage experience by the time they became the Three Tenors, so they really knew what they were doing with their voices. And now we see people going straight to the stadiums before they've even really established their vocal or artistic profile. 7) TH: Are there some classical musicians that have come around in the last 10 years that you're really excited about? AM: Yes, there's a whole crop of exciting, young conductors. Gustavo Dudamel is going to be everybody's first name on that list — the 28-year-old new music director at the Los Angeles Philharmonic who came to prominence in the El Sistema system in Venezuela of youth orchestras. He has been touring the world with the Simon Bolivar Youth Orchestra to tremendous, sort of rock star levels of excitement. It's a really exciting phenomenon in that he's quite a brilliant, natural conductor and the kids are very talented. The big question mark is where he goes artistically following the incredible enthusiasm for his natural ability. And he has to figure out what it is he wants to say now that he can say anything he wants. And that's going to be an interesting thing to follow. In terms of singers, soprano Anna Netrebko was really a phenomenon in the last ten years — also a wonderful talent, also a lot of questions about her development. Her wisdom into rushing into certain roles. But a truly a beautiful voice and now a bit of a question mark as she moves forward in terms of how she moves forward in having it all "mom and idol" lifestyle. 8) TH: Do you have any thoughts on where classical radio is going? AM: Well satellite radio has certainly been a rise and fall in the last ten years. It was going to be the great future and now it's kind of just holding its own. But I don't think it's seen as the great white hope to the same degree it was. I think it's become one more offering on the palette. TH: One thing that's happened is that so many NPR member stations, who have traditionally been the bastions of classical music, have implemented a programming shift where music has little by little — and sometimes by a lot — been dropped for news and talk programming. So there's a little less music out there on traditional terrestrial radio. AM: There's quite a lot less out there, I think. There are some stations that prevail and continue: WFMT in Chicago, King-FM in Seattle, WNYC in New York has just bought WQXR. It's an interesting thing in that I would say classical radio is one of the topics that most exacerbates the readers who write to me. I hear an awful lot about classical radio and people's frustration with it. And people's frustration with the conventionality of the programming. That real classical music lovers are frustrated with having to listen to the real meat and potatoes, the same symphonies over and over again. And yet classical radio stations say that in order to get the donations that we need to survive, this is what we need to play. I saw this as possibly a big topic, because I hear so much from readers about it, but it was pointed out to me — and I think it's true — that this is what people always feel about all kinds of radio. That pop listeners are all saying "Radio is crap these days. They don't really play anything I want to hear. It's always the same old, same old." And so this is more an age old question having to do with the supply and demand issues of radio than something particular to classical music. TH: Although it might rear its head in the instance that you just mentioned with WNYC and WQXR. In trying to grab those QXR listeners, it might depend on whether they're going to be listeners who are also going to be donors and things like that. AM: It's a big question because WQXR has represented the more conventional, conservative kind of classical radio and WNYC has stood for the new. And the fact that one owns the other, people are going to be upset if WNYC goes traditional. WQXR listeners are going to be all up in arms about "don't change our format." And WNYC does have a real tight rope walk to go. Furthermore, WNYC is one of those stations that dropped a lot of its classical programming in favor of news and talk inciting a firestorm of protest against New Yorkers, most of whom — at least the high profile ones if you ever asked them about their listening habits — proved never ever to listen to WNYC, which was part of their problem. But it was the principle of the thing that mattered, and this is what stations have to deal with. TH: And of course, in the last week or so, WNYC has announced its new Q2 web stream which is a classical channel that's going to sound more like the adventurous programming they're known for. 9) TH: Do you think classical music is in better shape now than it was in the year 2000? AM: I would say, in a funny way, it is. In part because of the financial issues and the cultural issues, as our culture grows more away from classical music in many ways, I think a lot of the big institutions are having to face realities in a way that they weren't. They've been reluctant to do it all along, but I think you see orchestras, for example, reaching out to communities and trying to find ways to make themselves vibrant and redefine themselves. For some, it's kind of a rote thing of "oh we must do this to get grant money." 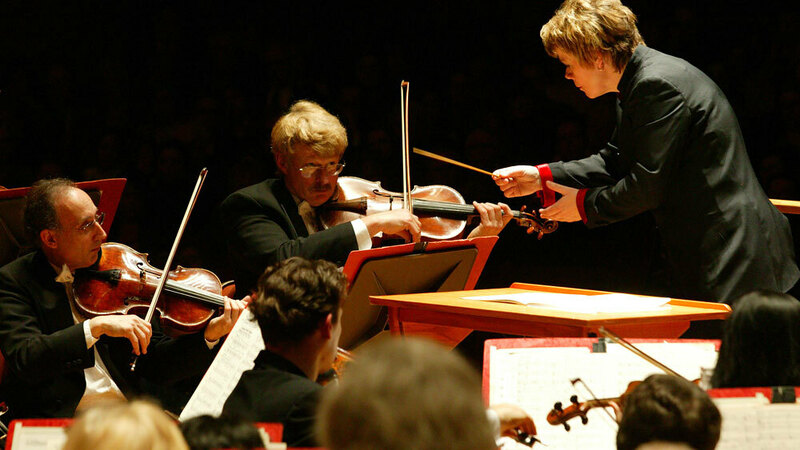 But when you see people really genuinely doing it — I think Marin Alsop in Baltimore for example is a wonderful and very interesting illustration of how a musician can be effective in ways that aren't necessarily all about making music. She's had tremendous success in Baltimore at a time of great financial hardship and really succeeded in galvanizing the community in a way that, Yuri Temirkanov, one of the greatest conductor's alive, was not able to through pure music-making. I'm not saying it that it's not about the music-making anymore, but I think the orchestras are trying to come out of the ivory tower and engage a little bit and I think they're going to have to in some way to survive whatever the success looks like for different orchestras. I don't think you can just fall back on the model anymore that "we offer the greatest music in the world and you better like that." And I think that's a good thing for the field. I think that concept of dialogue is enriching for musicians. AM: Well, Classical music will survive. I predict that. TH: Excellent. Good. I might still have a job. Are we going to be listening to classical music, or music in general, any differently ten years from now? AM: I hope we see a continuation of the kind of revitalization in terms of the venues and performances. I would love to see classical music be able to break out of its box a little bit. I think one of its biggest handicaps is still the traditional format — the idea of getting dressed up and going to a place with red, plush seats. It's something I love sometimes and many people love sometimes, but there are ways to appreciate this music without doing that. And it's music that has the ability to speak to a lot of people who don't know they will like it because it's not put in a place where they want to go hear it. And plenty of groups are looking at other places to perform classical music and I hope that continues in a way that you really can go to clubs like New York's Le Poisson Rouge, which just had a huge success since it opened as a kind of club where you can listen to alternative and classical music and drink and eat food. And it's proved to be a really successful model for trying out smaller-sized acts. TH: And I think even the San Francisco Symphony has booked non-classical acts before a classical event. AM: That's interesting. I'm interested in the Chiara Quartet, which is a conventional string quartet which has made a point of playing bars whenever it goes on tour. They have very interesting things to say about that experience, which is not necessarily geared toward a bar audience. If they're playing Beethoven for the year, they'll play Beethoven in the bar. But they've said that the excitement at seeing the people who liked other kinds of music also liking this music was what really gave them energy to go forward to see that yes, it still does have the power to reach out and touch, even if this audience is never ever going to come in. I think you have to change your expectations about what you want by reaching out to a new audience. People who are really getting young audiences are not necessarily getting an audience that the orchestra wants. I think some audiences have the image of scrubbed young faces and nice suits and that's not what's going to insure the future. The future is going to be a much more mixed up place than that. Anne Midgette is the classical music critic of 'The Washington Post.' Tom Huizenga is a music producer from NPR Music.